If you like what you see here, please feel free donate by clicking this link. Thank you. Minor cosmetic updates. Included the site's homepage URL in the "About" Window. 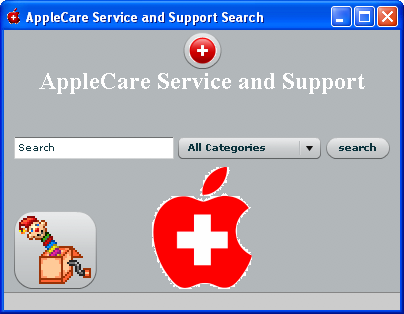 Ever need a quick question answered about an Apple product yet, you don't feel like calling AppleCare or even head over to the nearest Apple Retail Store? 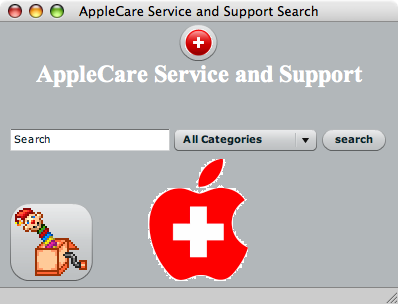 Well, surprisingly, many users of Apple products aren't aware of the huge knowledge base that Apple has online. Well now, you can search this massive collection of information right from your desktop. In this application there are 6 search categories. "All Categories" , "Technical Articles" , "Downloads", "Specifications", "Manuals" and "Help". Select what category you want to search in, enter the search term you are looking for, hit enter and BOOM, it displays the search results in your default browser. Since this application is based on the Adobe Integrated Runtime, it'll work on Macs as well as Windows PCs. Step 1: Install Adobe's AIR As I mentioned before, the software runs using the new Adobe Integrated Runtime (AIR). What's AIR you ask? It's not the type of air you breathe. This AIR works like Flash if you're familiar with that. You install a little piece of code on your computer and then you can run any piece of software written for it. Don't know if you have it? If you're not sure, you probably don't have it installed, so go ahead and install it now. Choose one of the links above depending on your Operating System. Step 2: Download and install the software Cool, you've got AIR installed. Now, you're ready to install the software. Just download the file below to your computer, then double-click the bright red icon on your computer (like the one pictured below) where you saved the file. You're good to go. Thanks to DC_Hall & Ajaxx42 from the Adobe AIR forums and Edward Mansouri from Airapps.net for their help with my problems coding this app! !